Texas C4L has made great strides in fighting the dangerous and unconstitutional red light cameras in Texas. For the first time the Texas Senate Transportation Committee has voted for a ban bill to be sent to the floor of the Senate. SB 714 is a good start but if passed as it is it may grandfather existing cameras for several years. Texas C4L testified on SB 714 expressing our concerns with the language and bill sponsor Senator Hall indicated he would work on changes to make the ban immediate. Our efforts should now be focused on the House Transportation chair Joe Pickett Democrat from El Paso. It is reported that he plans on never letting a camera ban bill come out of his committee. Please contact Joe Pickett's office right away and demand he pass Representative Gary Elkins' Red Light Camera Ban bill through his committee. 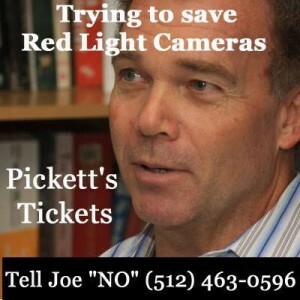 Please call 512-463-0596 and demand Joe Pickett pass the red light camera ban bill out of the House Transportation Committee. If the camera ban bill dies in the House I hope everyone thinks of "Pickett's Tickets" whenever one of these scam tickets go out.